Time flies! We can’t believe it’s already been 20 years in St. Catharines. We’re so proud to have been part of the wonderful community in St. Catharines for the last two decades! Here’s to forward to many more years of partnership in the future! 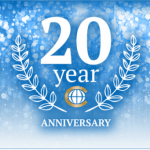 Join us at our 20th-anniversary celebration at the Pen Centre location this Wednesday, March 27th. We’ll be offering exclusive exchange rates all day long in celebration. In addition, everyone is welcome to visit the branch and join us for coffee and cake all day from 9:30am to 8:00pm. Stop in and grab some free treats while they last! We’ll be around to talk shop and serve any foreign exchange needs you may have. Two decades is no small feat! We’d like to take a moment to thank the people that made it happen. Firstly, thank-you to our loyal clients for supporting us. We couldn’t have done it without your continued patronage. Next, our gratitude goes to the St. Catharines and Pen Centre community for welcoming us and creating a fantastic environment to set up shop and call home. Last, and certainly not least, thank-you to our dedicated staff. We wouldn’t be here without you! With our recent launch of OneCard, Canada’s Multi-Currency Card™, we’re paving the way to the future of travel and currency exchange. OneCard holds four different currencies (CAD, USD, EUR, and GBP) and serves as a loadable debit card around the world. Plus, you get the same great rates you’ve come to expect from Continental and tons of other perks like family sharing, loading and converting money on the fly, and more! Pick up yours along with some cash during the celebration, and you’ll be entered to win $500! 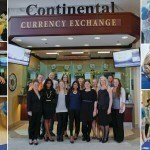 Visit our Continental Currency Exchange branch at the Pen Centre today!